This is the ‘Sources Reference page’, the single location for builders to understand where particular engine parts come from. The numerical listing below is directly from my 2014 conversion manual. It has been abbreviated to distill it down to the parts it takes to complete and run an engine at A Corvair College. The new development this year (2015) is Dan Weseman of SPA/Panther and myself now cover the full list of parts. In years past, we have had others provide some of the parts or an optional 5th bearing. But today, for the sake of builder progress, getting this done faster, and simplifying the process. Some of the old sources still make a trickle of parts, but Dan and I have committed to making the investment of great amounts of time and money to mass produce the parts and stock them. In years past, having an item like heads made by a guy who treated the task as a part time hobby lead to the number of successful builders being limited by one suppliers unwillingness to address the demand. From here forward, the number of successful builders will be determined only by the number of builders motivated to learn build and fly. Since 2011 we have held four Corvair Colleges per year, and in 2016, we are looking at raising the pace to five or even six Colleges. In years past I was always more than fair about bringing in smaller suppliers and encouraging builders to consider their work, but I have moved away from this because the smaller suppliers never took meeting the actual needs of builders seriously. Today I have no problem if a builder brings a set of Falcon heads or a Roy bearing to a college to finish his engine, but any builder getting started now, should just follow the sources below, because it is the proven way to make progress now. It is much easier for Dan and I to coordinate to make sure every builder get all the parts he needs, and they are fully compatible. Dan works most of the Corvair Colleges with me to demonstrate and supervise the installation and assembly of his products. If you are planning on assembling your engine at a College, utilizing a Crank, 5th bearing and heads from Dan makes sense. Notes on this reference page: Groups marked with a WW are from us, Flycorvair.com. 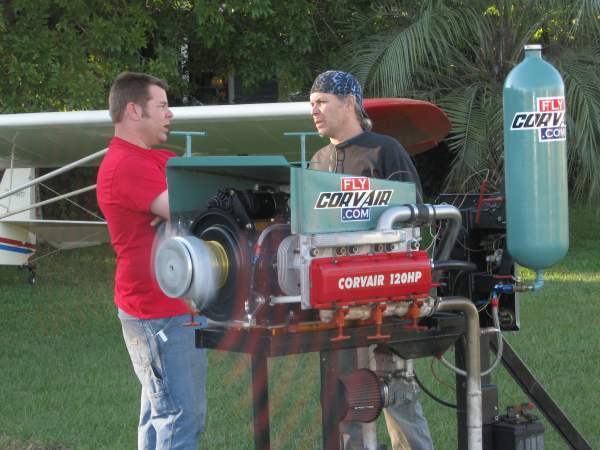 Our products page is here: http://www.flycorvair.com/products.html . Groups marked with SPA, are from Dan and Rachel Weseman, their site is here: http://flywithspa.com/corvair/ . Below many of the group listings are links to go to stories about that specific group. At the bottom of the page are a set of links to stories about up to date sources and specific engines. This page will be continuously updated. Seems to me you are moving in the right direction.